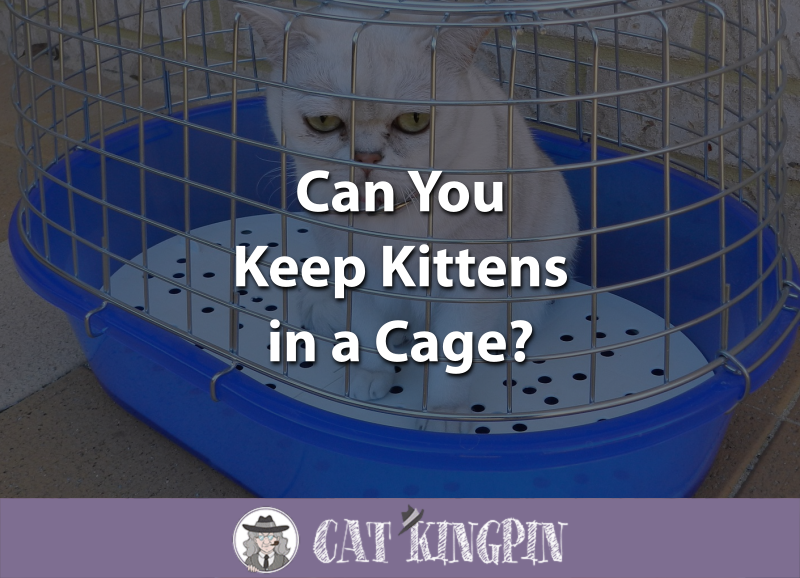 » Can You Keep Kittens in a Cage? Since it’s common and even recommended to crate puppies, many people wonder if they can keep their kitten in a crate, too. Crating a puppy is a great way to keep your home and dog safe, but can you keep kittens in a cage? While it may be tempting to crate your kitten when you can’t supervise them, kittens and puppies are two different creatures with vastly different needs. It’s not advisable to keep a kitten in a cage, mostly because it limits their ability to use the litter box. It also limits their movement and won’t make them very happy. There are ways to keep your kitten and home safe without resorting to a crate, however, and it’s important to learn about the proper way to confine and supervise a young kitten. Where Should Kittens Be During the Day? Kittens are curious little critters that have a tendency to get into everything. So, even if you’ve done your best to “kitten proof” your home, your furry friend is likely to find something mischievous to do anyway. While you may think it’s a good idea to crate your kitten, both to keep them from getting into trouble and to protect your couch, it’s unkind to keep a kitten in a cage and you should never do it. Kittens are explorers; they discover the world around them by exploring every inch of it. Your kitten will only get used to living in your home if they are allowed to wander around it. Depriving them of the opportunity to discover their new home is unkind, and a pretty good indication that you aren’t ready for the responsibility of a kitten. If you’re worried about your kitten getting into something that could potentially harm them, you may want to consider limiting their access to the whole house. For example, many new kitten owners find that using a gate to keep a kitten in the kitchen or a large bathroom is a good alternative to enclosing them in a cage. First, we’ll state the obvious: your kitten should sleep in a bed. Whether that bed is a special bed made for cats or your own bed is up to you, but it’s your responsibility as a kitten owner to provide them with a comfortable and safe place to sleep. Actually, while your kitten is very young it may be a good idea to give them their own bed to sleep in, as you want them to be free to get in and out of bed at night to use the litter box if they need to. Kittens urinate pretty frequently, and if a small kitten is sleeping in your bed, they may have difficulty getting down and will decide to do their business between your blankets instead. Pick a kitten bed that is comfortable, washable, warm, and appropriately-sized, such as the Aspen Self-Warming Pet Bed. Some kittens will appreciate a bed that makes them feel safe. Kittens tend to hide when they need a moment to themselves or they are feeling overwhelmed, and enclosed beds, such as the Pet Palace bed, provide your kitten with a safe and comfortable nook to curl up in. You should keep your kitten’s bed in a safe part of the home. Kittens have a tendency to roam around during the night, and you won’t be awake to supervise them, so you should arrange to have your kitten sleep in a room that has been thoroughly kitten-proofed. Kitchens and bathrooms are good places to keep a kitten. Both tend to have hard floors as opposed to carpeting and can be easily kitten-proofed. Take care to remove or hide any potentially harmful cleaning agents and wires! You don’t have to buy your kitten a tiny human bed and tuck them in at night…but no judgement if you do! Because kittens are notoriously mischievous, you may be uncomfortable giving them the full run of the house during the day if you can’t supervise them. Many kitten owners find it helpful to confine their kitten in a safe, enclosed room while they’re at work during the day. Once again, bathrooms and kitchens are particularly good spots. No matter where you decide to keep your kitten, be sure to provide them with plenty of fresh water and access to their litter box. A few toys and a scratching post are also essential as they will keep your kitten occupied and out of trouble. Some scratching posts such as the Bergan Turbo Scratcher come equipped with a toy, so your kitten can scratch and play to their heart’s content. This kitten is using his scratching post. A busy kitten is a happy kitten! A big part of supervising your kitten is making sure they can’t get into something that could make them sick. You should take care to thoroughly kitten-proof your house before bringing your new kitten home. Learn what plants are dangerous to cats and remove them from the house. Simply putting them up high is no guarantee that your kitten won’t be able to get ahold of them, so the safest thing to do is to remove them completely. Put away breakable objects or put them someplace where your kitten can’t get to them. Unplug and store electrical cords and wires when they aren’t in use. For electronics that need to remain plugged in, such as a computer or a lamp, you may want to invest in a protective covering for your wires. Kittens have a tendency to chew on exposed wires, which can be very hazardous. Protective coverings, such as the CritterCord, cover the wire to protect it from sharp kitten teeth. Lock away all household cleaning products. This is especially important if you plan to confine your kitten to the bathroom or kitchen in the early days when you can’t supervise them. So, can you keep kittens in cages? Long story short, putting your kitten in a cage is never a good option. Instead, you should kitten-proof your home; confine your kitten in a room with their litter box, fresh water, and a fun scratching post when necessary, and keep an eye on them when they do have run of the house. What did you think of our post about keeping kittens in cages? How do you keep your kitten safe when you’re not around to watch them? Tell us in the comments below as we’d love to hear from you!